Memories of the 1950s fight against the Western Freeway. Every time that I find myself driving northbound on Interstate 280, and exiting onto Junipero Serra Boulevard, on the way into San Francisco, I think of my father and our neighbor Bill, and bless them for something that they did back in 1955. 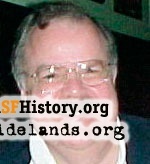 At the time, both the State of California and the San Francisco Board of Supervisors (mostly a bunch of older Irish males back then, but just as cantankerous, divisive, and argumentative as those Boards that have come into power after them), decreed that a massive freeway plan was necessary to keep San Francisco traffic moving. One part of that plan was a monstrosity called the Western Freeway, envisioned by its designers as an essentially straight line from San Francisco International Airport to the Golden Gate Bridge. The original San Francisco Planning Department Freeway Plan of 1948 had morphed itself into a slightly altered version by 1951 and finally, into something known as the 1955 Trafficways Plan, thus setting the stage for what was to come. There were no environmental impact reports required in those days, but any casual observer could tell that the plan would have involved the removal or the demolition of hundreds of homes and businesses in the freeway's path, and the destruction of several neighborhoods. Thousands more residents, whose homes were not slated for removal, still faced the unpleasant prospect of looking out a front window onto massive concrete pylons, overpasses, support pillars, and retaining walls. Richard Brandi's West Portal book displays a map of the plan in horrific clarity---a northward continuation of an 8-lane wide freeway from the 19th Avenue exit of Interstate 280, superimposing itself and obliterating the present Junipero Serra Boulevard, with overcrossings at Winston, Ocean, and Sloat. The plan then became even more destructive, calling for the demolition of virtually all the West Portal homes and businesses between 14th Avenue and Sloat, along with some Portola Drive houses, before moving in a straight line through the property situated between 14th Avenue and 15th Avenue, resulting in the removal of approximately 200 homes on the west side of 14th Avenue and the east side of 15th Avenue from Wawona, all the way north, four blocks to Santiago Street. 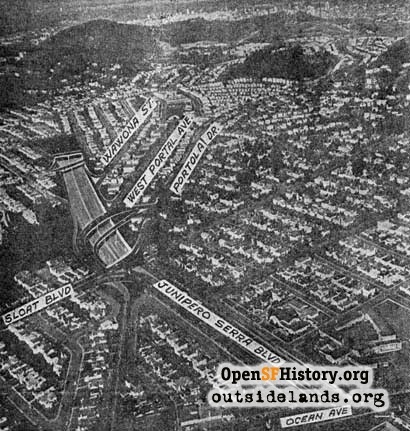 At Santiago, between 14th Avenue and 15th Avenue, this 8-lane wide serpent would have plunged underground into a tunnel, snaking beneath Rivera, Funston, 12th, Quintara, Cragmont, 10th, Pacheco, 9th, 8th, and Ortega, before re-emerging as a surface freeway just north of Laguna Honda Boulevard and the Forest Hill Muni Station. From that point, the freeway was to have continued north, resurfacing as a sort of Loch Ness monster, and devouring even more homes and businesses in the inner Sunset, entering Golden Gate Park at about 9th Avenue, and obliterating the Hall of Flowers before veering west. Like a destructive tornado, it would have cut a path through the Park, tearing through the Rose Garden, before finally exiting at Fulton Street. 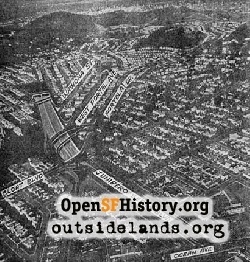 From that point, it would have connected with Park Presidio Boulevard, whose tree-line path was slated to have been torn out and converted to freeway status, with a few east-west overpasses. 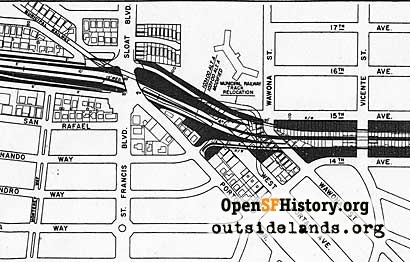 This final surface section would have resulted in an additional loss of homes and businesses, bulldozing its way through the Richmond District, all the way to the Golden Gate Bridge toll plaza. Not a pretty sight at all. The construction dirt and debris would have been unthinkable, let alone the final product. The constant roar of traffic, day and night, would have echoed through the terrain, spreading the blight over an even larger area. FOR SALE signs began to sprout like weeds throughout the neighborhood. It was the beginning of big city flight to the suburbs. More than a few of our neighbors sold and headed south, to Westlake, San Bruno, or Millbrae. The public outcry grew louder, with headlines speculating, "San Franciscans To Be Forced Out of Homes." My parents, along with most of their neighbors, were far more than casual observers---they were proud homeowners of just a few years, with a couple of pre-schoolers, a mortgage, and a primary financial asset that sat smack in the middle of the freeway's path. Their church, St. Cecilia's then under construction, would also have been severely impacted by the planned Western Freeway through the adjacent blocks, virtually splitting the parish in two. St. Cecilia's pastor, Monsignor Harold E. Collins, no less a shrewd Irish politician than any of his lay counterparts on the Board of Supervisors or in Sacramento, declared war on the freeway, and rallied his troops. My Dad and Bill were a couple of ordinary San Francisco guys, who had lived in the Sunset District before World War II---Bill on 25th Avenue near Ulloa & Dad on 21st Avenue near Rivera. They were G.I.s who had come home in 1946, married their sweethearts, and started raising their families. By 1955, they were in their early 40s, and their idea of relaxation at the end of a long day's work was sitting at home in a comfortable armchair after dinner with the evening newspaper, or watching John Cameron Swayze on their new RCA television sets. Heeding Monsignor Collins' battle cry, Dad and Bill, along with several hundred other men and women in the neighborhood, got up from their chairs and marched off to Lincoln High School one cold, dark night in December of 1955, to attend a public meeting on what was being proposed. The turnout was enormous, and the angry crowd unanimous in opposing the freeway plan. The politicians were stunned. Seldom did the public rise up like this, and civic leaders were eventually forced to acknowledge that the Trafficways Plan might not be built as originally envisioned. The prospect of this quiet area being torn apart was unimaginable, argued the protesters. Then, as now, there were family connections throughout the individual neighborhoods that would have been sorely impacted, since most residents had friends and relations living nearby. Shopping at Stonestown, or on Taraval, or on West Portal Avenue, and then returning home would have involved criss-crossing a massive, curving freeway structure multiple times. Getting small children to and from the area's many elementary schools, such as St. Cecilia's, St. Anne's, West Portal Elementary, Parkside, and Commodore Sloat, would have been a logistical nightmare. 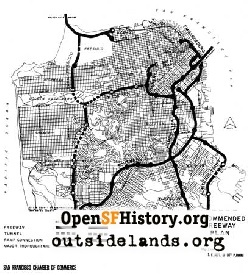 The peace and quiet of the entire west side of San Francisco would have been shattered, along with the daily lives of tens of thousands of residents. Miraculously, the public outcry had been heard. Alternatives were eventually proposed and rejected, but people like Dad and Bill, and hundreds of their other friends and neighbors kept the pressure on the politicians, long and hard. It was a topic that remained on the minds of residents day after day, year in and year out, for almost four years. Given their own timetable, it took the San Francisco Board of Supervisors until 1959 to officially vote to kill the Western Freeway, and to put all further freeway construction within San Francisco on hold. The "Freeway Revolt" had scored a big win in the Board's fateful decision. A collective sigh of relief went up from the Western Neighborhoods, and the Trafficways maps were tucked away into the silence of oblivion. It was no coincidence that property values rose instantly, and that they shot up more than 30-fold in the next half century. Today, we sometimes creep along 19th Avenue and Park Presidio, to and from the Golden Gate Bridge, slowed by the traffic. At time like this, we need to take a look around at all the tidy stucco houses and flats covering the landscape, plus the small, special businesses that so many of us favor, and realize that this landscape was preserved for us by ordinary residents---men and women who attended that December 1955 meeting at Lincoln High School, and expressed their collective outrage to the politicians more than half a century ago. For all of us who lived there then, for all who came after us, and for all those future residents who may call the area home, it remains a welcoming and hospitable place, thanks to people like Dad and Bill (gone since 1967 and 1980 respectively)---a couple of ordinary guys who decided to get up out of their comfortable armchairs so long ago, to spend one night out. Page launched 28 January 2009.